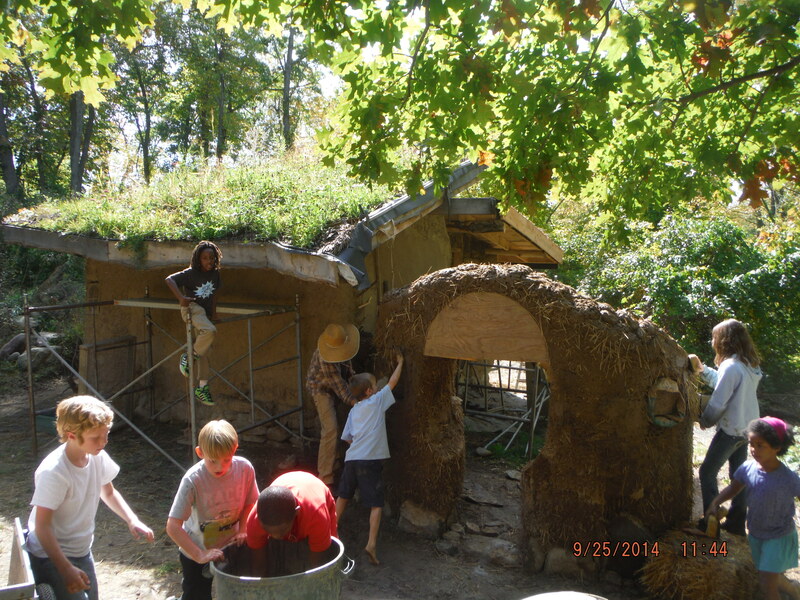 The Strawbale Studio program wants to make building & natural skills available to youth and young adults. What your donation will do. Consider a one-time contribution, or a micro-donation monthly. Many wonderful events happened in 2015 ! This list has links to more description and pictures for each event. Below are also lists of Intern, New Projects, Media, Supporters, College Credits, Improvements, Guest Instructors and more. Students from the Gibbs Center ~ who live together and do fabulous sustainability projects ~ came to the Strawbale Studio for a program to learn additional skills to take back to their program. On December 19 & 20, 2015 these students from Derek Kanwischers’ Western Michigan University “Sustainable Projects Program” arrived, stayed overnight and did a variety of hands-on projects utilizing natural materials. FRIDAY: The students arrived at the Strawbale Studio at 3pm and began with a tour of the natural buildings and grounds, followed by making dipped beeswax candles and gifts from natural materials, cooking chili on the outdoor Rocket Cooker, then enjoying the rest of the evening carving wooden spoons ! Students camped out in the main house for the night. SATURDAY: An awesome burrito breakfast was created, complete with local eggs & greens and some sourdough bread made by Christine’s’ mom. Next, we fired up the Rocket Mass Heater in the Red Shed, and the Earth Oven, learning the theory and strategies for both ! Derek Kanwischer, who leads the Sustainable Projects program gave a powerpoint presentation of their Permaculture projects at the Gibbs Center, including their Composting Furnace which heats the 3 growing beds in their Green House (see picture above). Awesome. The rest of the morning we explored social permaculture and its relationship to Non-Violent Communication. Observations, needs, quality of connection, ethics ! Included in the conversation was a discussion of the “Continuum” of natural materials and building processes that help us think about the qualities and values embedded in the materials we choose. Natural to synthetic, local to distant, low to high embodied energy, and more. For lunch we baked pizzas in the Earth Oven ~ made with dough made by Christina’s mom, each of us spreading the dough ball and vegies from the Gibbs Hoop House. After lunch the students super-enjoyed sitting on the warm bench of the Rocket Mass Heater which made the Red Shed a very cozy place to be. Deanne made a brief presentation on Round Pole framing as we observed and and discussed the types of notches used in trusses, post and beams and bracing. Included was a lashing demonstration. Next was a thatching demonstration and a wee bit of hands-on, using the frame in the Red Shed. Lots of questions on this. Our last demonstration was finished earth plasters, the mixing of 1/8″ sifted clay sand subsoil, with a little bit of starch paste we made earlier, applied to a cob brick, and burnished when leather hard with a plastic disc, a sponge & a trowel…Either technique could be used when then finish their Earth Oven at the Gibbs Center. We all really enjoyed the learning and sharing of our time together. These young folks who are in the program have a variety of majors which create a mosaic of hope. They are doing really inspiring things, such as using heat from biological wastes sawdust, wood chips, manure) to create heat in a Compost Furnace, which heats the growing beds in their greenhouse to 60 degrees ! Chatsfield School in Lapeer has an ecology club that lead by Peter McCreedy and assistant, Jenny. This enthusiastic Green Club group rolled into the Strawbale Studio for a tour of the grounds and buildings. The focus was Rocket Stoves, a big hit on a gray damp day. The cozy Rumford Fireplace in a little cabin, creates a cozy place to curl up with a good book. And the awesome Rocket Stove Heated bench really does warm up ! Their club does projects such as Earth Ovens, small buildings & Maple Syruping…LUCKILY, because they gifted Strawbale Studio with a jug of it, which I poured on pancakes made from the sourdough batter fermenting here in the kitchen. YUM. Peter McCreedy (the most fabulous teacher I have ever met) leads the way in exploring all sorts of natural projects at The Willows Ecological Educatio n Center (a 4500 sq. ft. strawbale building, with solar energy, a greenhouse and studio space for wilderness crafts) and surrounding grounds. During the tour he checked out the thatching process to apply to a Cahokia hut (right) that is being built at The Willows. Three wonderful Candle Classes were held this December filling the air with the scent of bees wax. We made our own wicks, dipped them into local bees wax ~ making lovely “tapers”. Folks also made earthen candle holders shaped from a modeling mix made entirely of subsoil harvested on this land. The candle holders and match boxes were creatively decorated with bits of nature foraged from outdoors ~ birch bark, rose hips, seed pods….each person inventing their own unique project. We ranged in age from 4 years to 69 years (was I the oldest !?) and our happiness was very apparent. What a natural thing to do. Both practical and artistic, and made from local materials. What a joy ! You could schedule a candle class for your group if you wish.